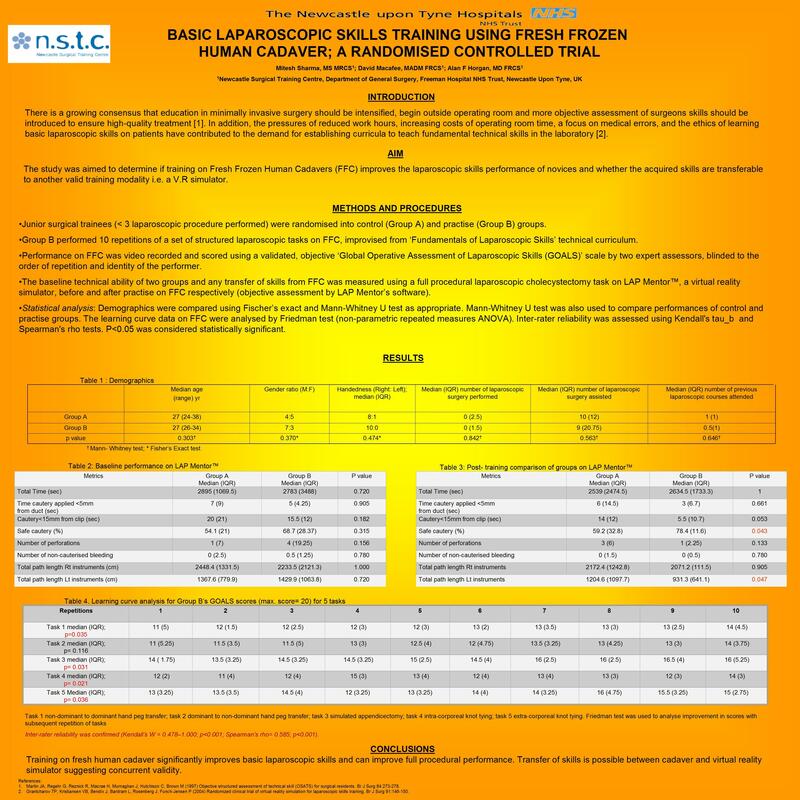 The study was aimed to determine if training on Fresh Frozen Human Cadavers (FFC) improves the laparoscopic skills performance of novices and whether the acquired skills are transferable to another valid training modality i.e a virtual reality simulator. Junior surgical trainees (< 3 laparoscopic procedure performed) were randomised into control (Group A) and practise (Group B) groups. Group B performed 10 repetitions of a set of structured laparoscopic tasks on FFC, improvised from ‘Fundamentals of Laparoscopic Skills’ technical curriculum. Performance on FFC was scored using a validated, objective ‘Global Operative Assessment of Laparoscopic Skills (GOALS)’ scale by expert assessors, blinded to the order of repetition and identity of the performer. The baseline technical ability of two groups and any transfer of skills from FFC was measured using a full procedural laparoscopic cholecystectomy task on LAP Mentor™, a virtual reality simulator, before and after practise on FFC respectively. The data were analysed with SPSS® version 17. Demographics were compared using Fischer’s exact and Mann-Whitney U test as appropriate. Mann-Whitney U test was also used to compare performances of control and practise groups. The learning curve data on FFC were analysed by Friedman test (non-parametric repeated measures ANOVA). Inter-rater reliability was assessed using Kendall’s tau_b and Spearman’s rho tests. P<0.05 was considered statistically significant. Twenty candidates were randomised, of whom one withdrew before the study commenced and 19 were analyzed (Group A, n=9; Group B; n=10). Four out of five tasks (non dominant to dominant hand transfer; simulated appendicectomy; intra-corporeal and extra-corporeal knot tying) on FFC showed significant improvement within 10 repetitions on learning curve analysis (p<0.05). Post-training significant improvement was ‘shown for safety of cautery’ (p=0.040) and ‘left arm path length’ (p=0.047) on LAP Mentor™ by the practise group. Inter-rater reliability was confirmed (Kendall’s W = 0.478–1.000; p<0.001; Spearman’s rho= 0.585; p<0.001). Training on fresh human cadaver significantly improves basic laparoscopic skills and can improve full procedural performance. Transfer of skills is possible between cadaver and virtual reality simulator suggesting concurrent validity.